For those of us who have spent any time involved, even peripherally, in the occult scene, James Wasserman needs no introduction. He has been one of the most prominent movers and shakers in the esoteric subculture since the seventies. His reputation proceeds him, without question. His presence in the midst of some of the most important events, especially pertaining to Aleister Crowley’s legacy, in the later half of the twentieth century is truly mind-boggling. In the Center of the Fire: A Memoir of the Occult (1966-1989) is an important addition into the annals of occult history, not only in regard to Thelema and the O.T.O., but also to the crazy New York scene that he was knee-deep in and his involvement in the very heart of the pagan publishing arena. It’s all here, warts and all. In the Center of the Fire is a veritable who’s who of the occult scene of the seventies and eighties. Wasserman moved amongst them all and was an integral cog in the machine that saw the preservation and publication of some of the most important esoteric works in history. 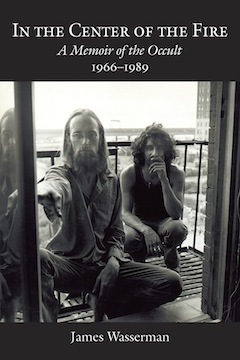 But more than all that, Wasserman’s memoir is a truly heartfelt account of his magickal life, of his loves and passions, of his prolific drug use, and his incredible journey through the fantastical New York landscape where the esoteric fires burned brightest. I had very high expectations of this book and they were fully met. For those with any interest in the history of modern magick, this memoir is more than a “must-read”. In the Center of the Fire is an important work that sheds light on the past, but is also an inspiring chronicle of one man’s magickal journey, made even more poignant for me because I see my own journey reflected in his in so many ways. Maybe you will too. In the Center of the Fire: A Memoir of the Occult (1966-1989) is available wherever books are sold, but, as I understand it, you can snag an autographed copy directly from James Wasserman’s Studio 31. Do yourself a favor — track down this book. I’ve not read a better one this year. This entry was posted on June 26, 2012 at 9:44 am and is filed under Archive with tags Aleister Crowley, Ibis Press, In the Center of the Fire, James Wasserman, Studio 31, Weiser Books. You can follow any responses to this entry through the RSS 2.0 feed. You can leave a response, or trackback from your own site.